Kate Summer practicing her leg lifts. All she needs is a tutu. 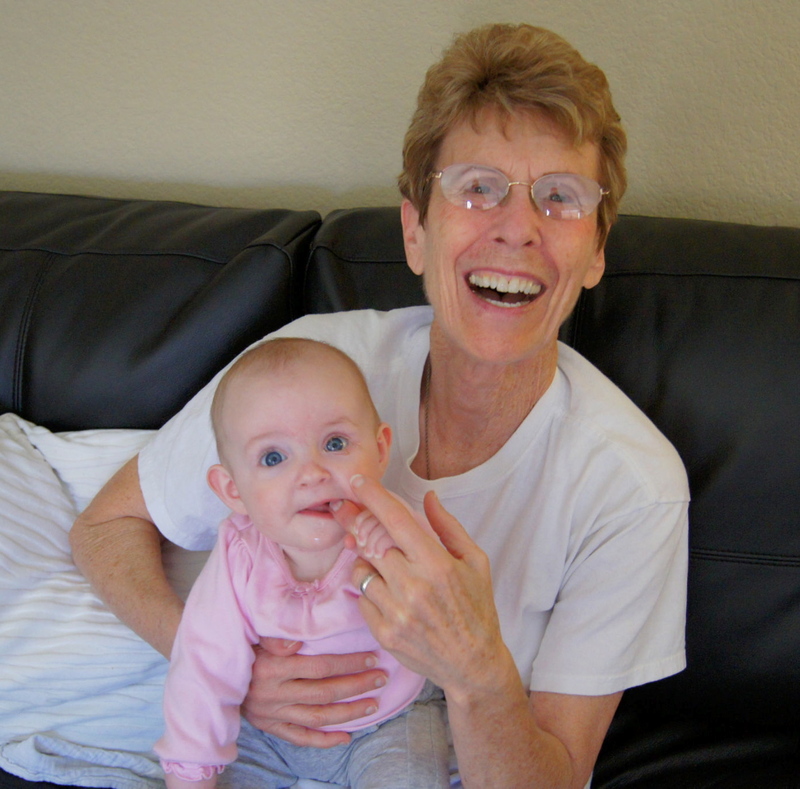 Meet little Kate, my newest great niece who, in this picture, is just a week shy of being six months old. I am sure she is going to be a ballet dancer as she loves to kick her legs and practice her flexibility. She has quite a personality and uses her smile and pretty blue eyes to get attention. She doesn’t fuss much except when she’s hungry or needs to be changed…and even then she’s not a holy terror. 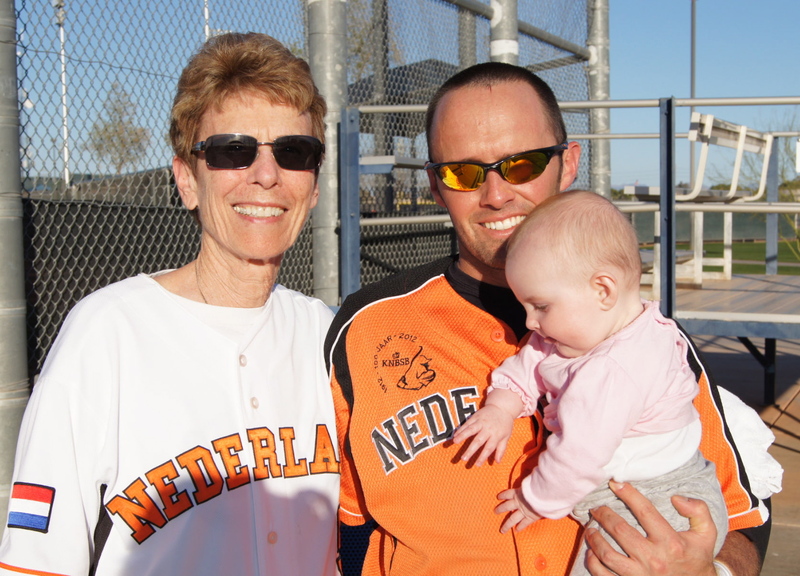 Kate’s daddy, Michael, plays baseball for the Dutch National Baseball Team and was in Phoenix/Scottsdale area for spring practice and to try out for the Dutch World Baseball Team. (He did make the team and is now in Taiwan awaiting the opening game on March 2. They will be playing South Korea). Floor (Michael’s wife) with her Aunt, Jolanda and Uncle Reinier flew out to enjoy some sun as well as catch some games and good bargains at the outlet stores. 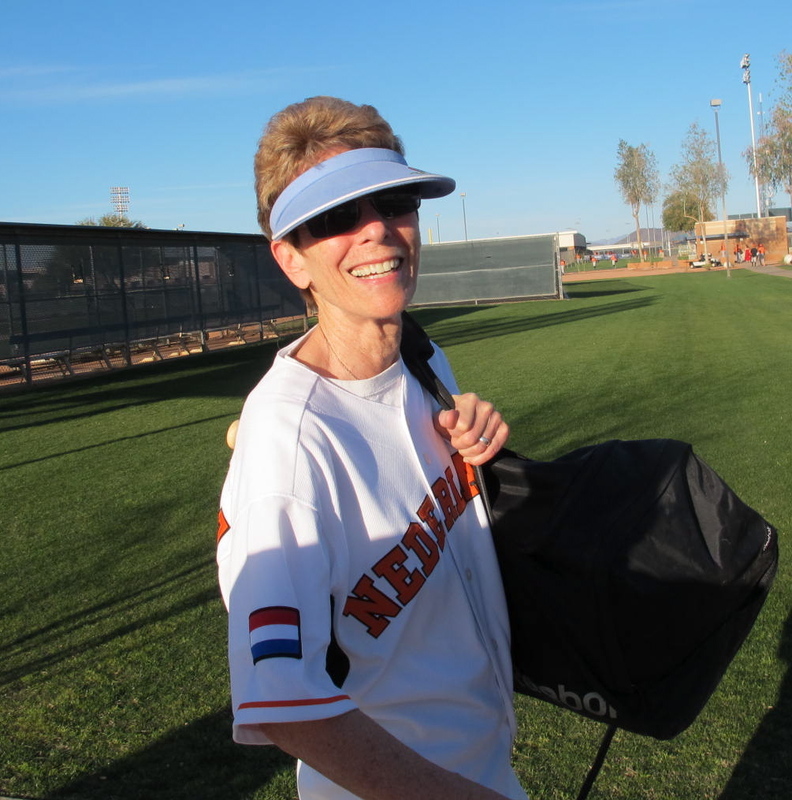 It wasn’t long after I arrived that we all piled into a rented van and drove to the San Francisco Giants’ training facility (I believe Michael said this was where the Giants minor leaguers train) to watch Michael’s team play the Paradise Valley College team. The Dutch won handily and looked with their hitting and fielding. 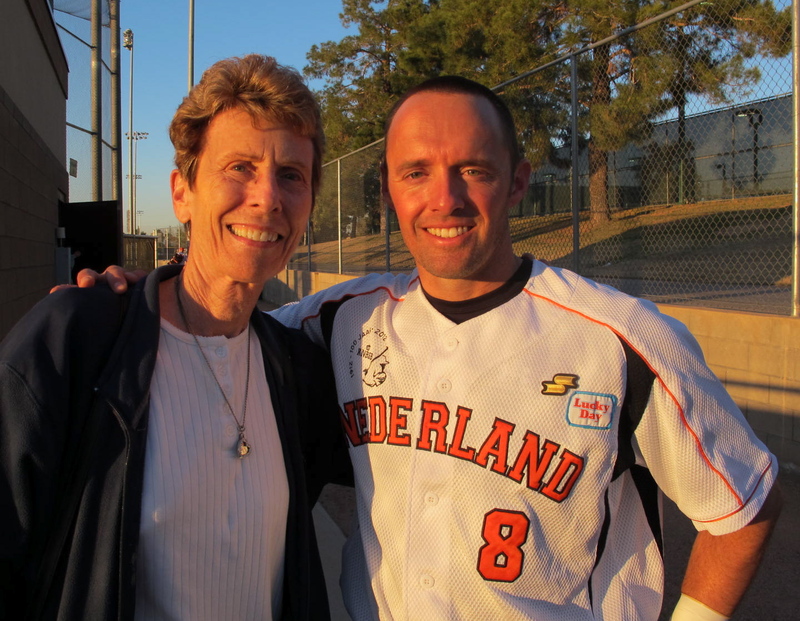 It reminded me of old times when Bob and I would go to the Cypress College games to watch Michael play. Michael Floor and Kate on Valentine’s Day, 2013. Kate’s first Valentine’s! The Dutch team usually eats together to help maintain togetherness and camaraderie, but Michael got special permission to be with us for dinner. Being as how it was Valentine’s Day, there were no nice restaurants with no or small lines, so we just took In and Out burgers home to enjoy at our leisure. They weren’t the best In and Out that I’ve had, but it was fun being together. I felt really special to be included with their family time in Phoenix. It meant very much to me. campus with even a Metro line type train that takes students (and I suppose the public) around campus and perhaps to points beyond. We didn’t ride it, so I don’t know where it goes. But we did walk around the campus to enjoy a most gorgeous day. There was some wind, but it was sunny and warming up from previous days. There are some older buildings from when the campus was begun to much more modern buildings with some still under construction. ASU is well known for its Palm Walk, a wide promenade with tall palm trees on either side of it. 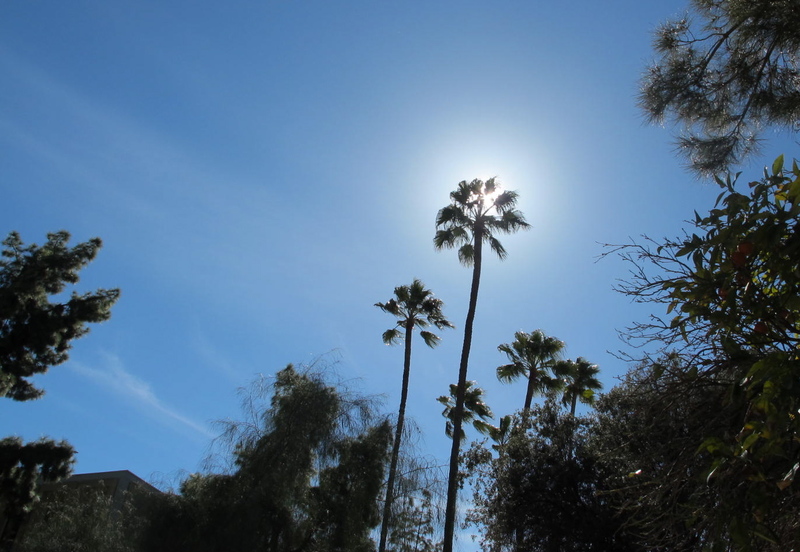 I thought it was pretty impressive but I particularly liked the sun behind one of the palms that was swaying in the breeze. As with all campuses, there are a lot of flyers stapled or taped on kiosks and we kept seeing one that had a horse’s head on it. 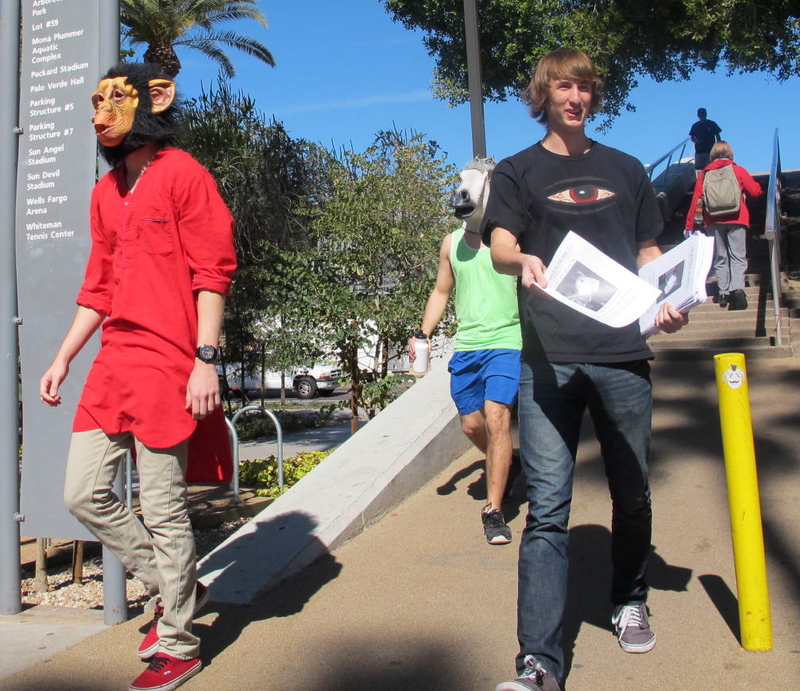 We didn’t understand the gist of it (and still don’t), but we did see some guys walking around campus, handing out flyers with not only the horse’s head, but a monkey’s head too. I hope it was a successful even, whatever it was. Isn’t there a book about a Pale White Horse? I don’t know about a red-shirted monkey. 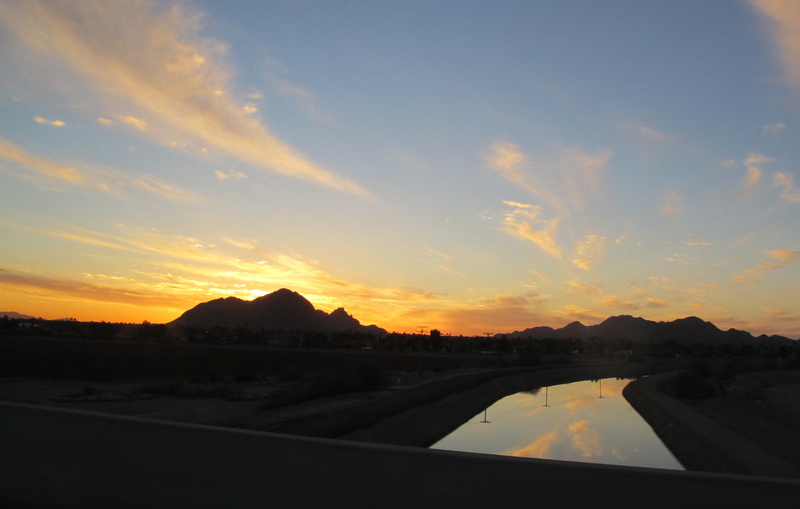 From the ASU campus, we drove over to Glendale to some outlet stores and enjoyed doing some shopping. Reinier was telling me that stuff is so much cheaper here, even though we might think it’s expensive. Holland has much stiffer taxes than we do and also has a value-added tax that really ends up socking it to the consumer. So while he was here, he stocked up on Levi’s, polo shirts and other apparel. I think I would do the same, given the same situation. One morning I got to watch Kate while Floor was taking a shower. This is not one of my normal activities and was a little apprehensive but since Floor was close by, I thought Kate would be safe. We had a good time together while we chatted about the day. Me in English and her in baby babble. We understood each other exactly. She became fascinated with one of my fingers and kept sticking it in her mouth as is evidenced by the following photo. She has a good grip for such a little tyke. minor league teams to play in during their season. I thought the fields looked very nice and Michael said they were nice to play on. The stands even had shade over them which is a nice luxury in many ball parks. 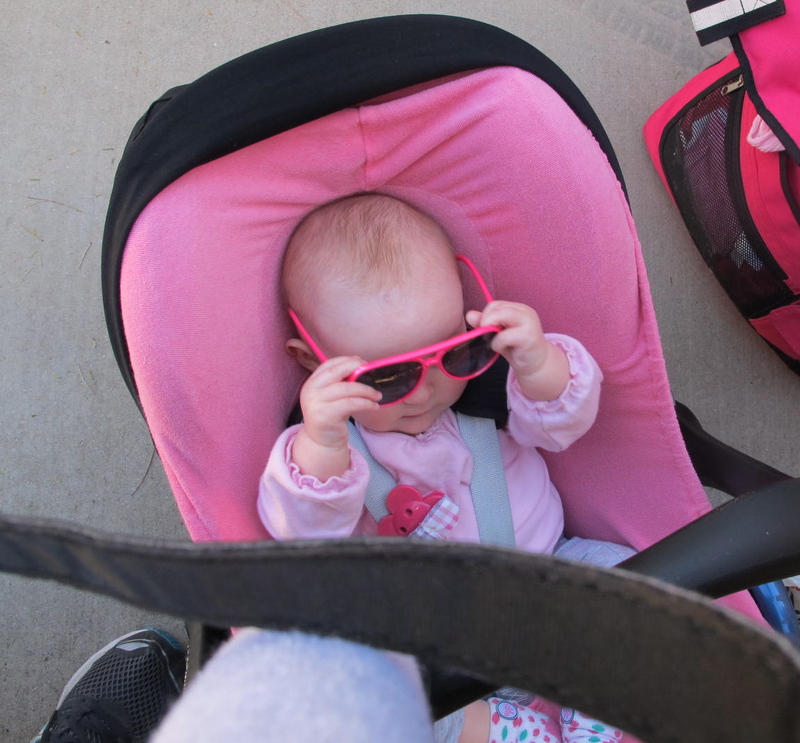 It was a very bright, sunny day and, of course, no fashionista would be without her shades. The Dutch were playing the Chinese who weren’t very good but I loved watching all the runs score even if a few errors were made. I think the final score was 14 to 1. There was no score board available and we had to rely upon two little leaguers who were keeping track. They were two boys from Washington who were visiting their aunt and were quite knowledgeable. 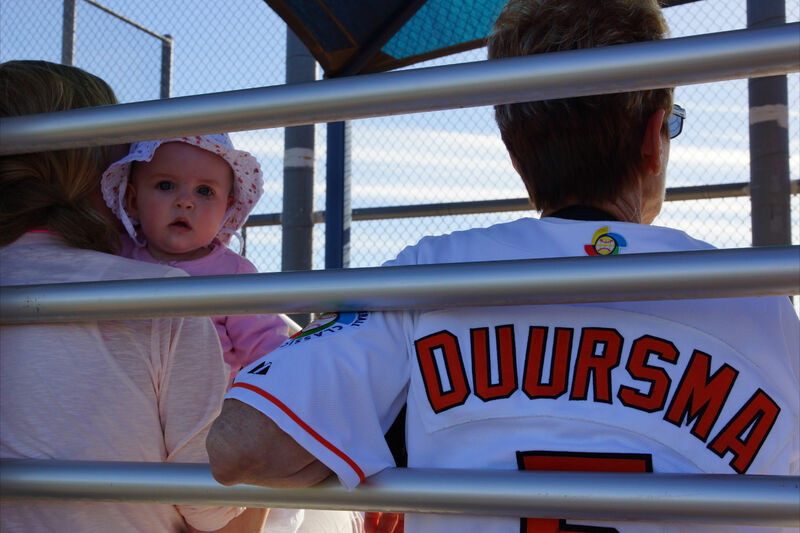 I enjoyed hearing their conversation with their aunt who was teaching them some of the finer points of the game. Michael played in the 2009 World Baseball Classic and was nice enough to give me one of his jerseys. I wore it to this game and it made somewhat of a stir with some folks in the audience. I thought it was a kick and was very proud to wear it. 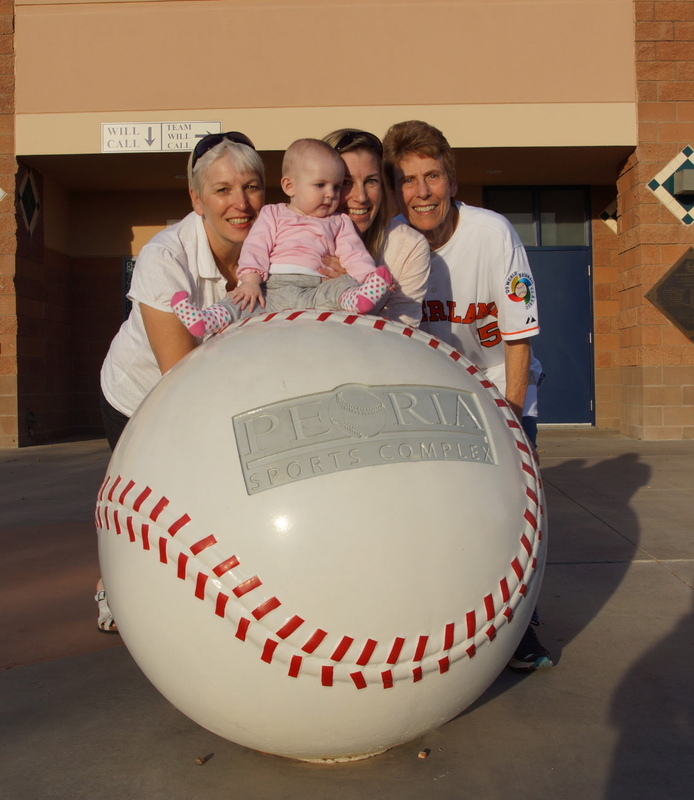 Michael had to ride back to Scottsdale with the team and we stopped to check out the Peoria stadium entrance. They have huge baseballs lining paths and the gates. Of course we had to get our pictures taken in front of the stadium by the baseballs. 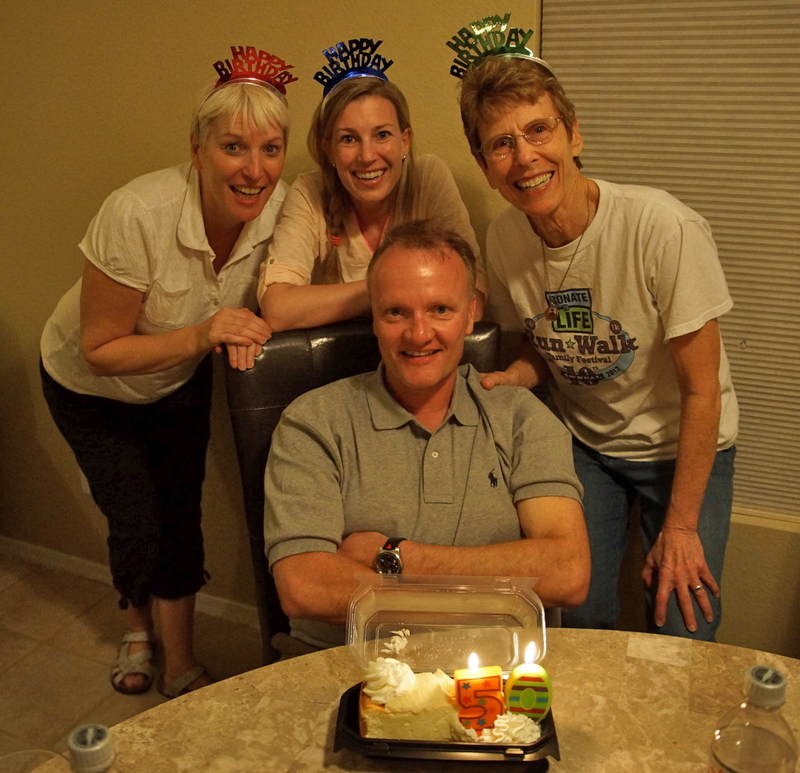 It was Reinier’s 50th birthday a day after we all were going back to our respective homes and we felt we had to celebrate all together in our Phoenix house. We stopped at a Cheesecake Factory to get each person a favorite flavor and then zoomed over to pick up Michael at the Scottsdale training facility. We decided to get some pizza to eat at home so as to let Kate stay on sort of a normal schedule. Reinier dropped us all off at the house and then went out to search for pizza. He programmed “take out pizza” into the GPS and ended up with a Papa Murphy’s pizza, not knowing that it’s not cooked at the store. It’s a take and bake. He was not a happy camper as he’d never heard of such a thing, but it all worked out ok and the pizza tasted good. Jolanda surprised him with a 50 candle and we celebrated with the cheesecake for dessert. A good time was had by all! Alas, all good things must come to an end and we all had to go home. Floor had to go back to work and Jolanda and Reinier had to get back to Delft to their 5 star Hotel de Ark (where Bob and I stayed for Michael and Floor’s wedding). We all cleaned the house and packed and then went our respective ways. Michael was practicing with the team when we left and had two more days before he would find out that he was going to Taiwan. Reinier took one last shot of the happy housemates in front of our house just prior to me leaving. 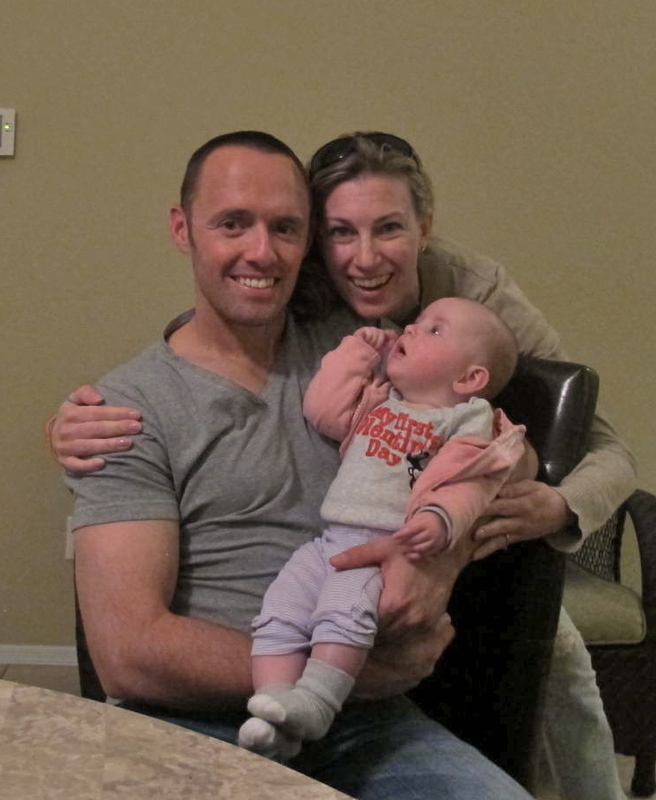 It was very exciting for me to be able to join the kids and Jolanda and Reinier in Phoenix even if it was only for a few days. We had a good time and had a chance to get reacquainted plus have new experiences together. They are all such fine people and make one feel at home. It’s just great to have relatives such as these. Thank you, Floor, Michael, Kate, Jolanda and Reinier! Great job, Cora! Kate is darling and you obviously have her wrapped around your finger! I’m always so impressed that you document your travels so well. I remember how much pressure there was on Shirley and me when you weren’t able to go on the Grand Canyon trip! We, not only had to be sociable and not fall overboard, we had to take pictures and notes and then try to write it up, Coralee style!!!! You are a tough act to follow!